A whirlwind of change has passed through the Vatican and it’s left many with a cocktail of emotions. After ten years as Director of the Holy See’s Press Office, Father Federico Lombardi has stepped down. He will be missed on many fronts — his serenity, poise and sense of humour for starters. As a result of the change, Pope has selected the refreshing combination of Greg Burke and Paloma García Ovejero to act as Director and Vice Director respectively. The changes are important symbolically and, one would expect, ‘materially’. Communications at the Vatican is in great flux. There appears to be a quest for greater efficiencies, perhaps more bridge building (which invariably passes through heightened “listening” measures) and less “pontificating*”. I’m happy to start a debate on this last trait – and would be happy with opinions/feedback if readers have knowledge or a gut instinct on the matter. See * below. 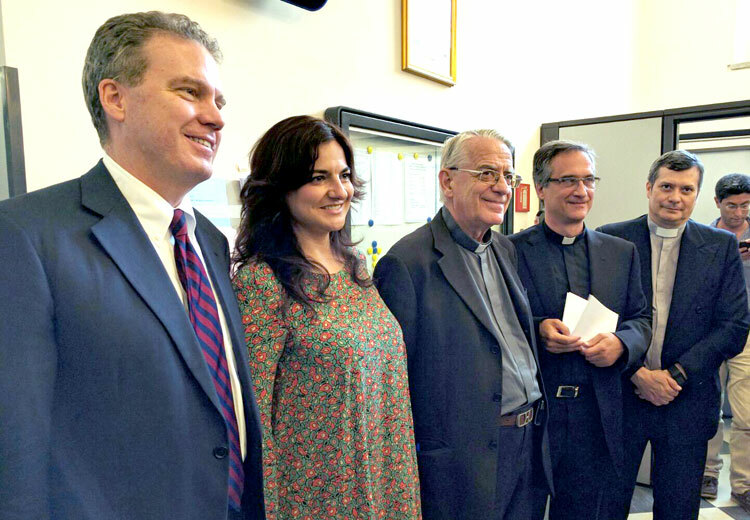 Greg Burke and Paloma García Ovejero – Director and Vice Director of the Holy See Press Office, and successors to Fr. Federico Lombardi. In my experience, there is nothing better than for an organization to have a leader who appreciates the profession and the most laudable characteristics of Communication: openness, sincere desire for listening/dialogue, patience, accountability and love of the truth. When these traits are present, the plans and activities that follow can count on fertile ground from which to grow. Greg Burke, new Director of Holy See Press Office, at the Vatican Press conference room. All of the parties involved – as well as anyone who works to bring the world closer together through dialogue and respect – can count on my positive vibes and thoughts (aka prayers) as they continue in their vocation of professional communicator .